Ascending to the Menorah to meet Messiah! Messianic nut-job strikes again! If you don’t like Hebrew, don’t read this! I LOVE the symbol of the Menorah, and what it represents. The meme above does not show that before he said, ‘in your ascending,’ He said “Say to Aharon,” This is the High Priest of Yisra’el. I read this while working on my own copy of Torah [we are commanded to write it!, it is a VERY spiritual process, I highly recommend it.] But I ‘saw’ something in it this time that blew my mind. We know from Hitgalut [Revelation] that the Menorah of the Temple was a picture of the Ruakh HaKodesh that burns in front of the throne of Elohim. We also know from that book that each Congregation, if it is founded on Torah, has a Menorah in its midst. But, that Yeshua Himself will take it away, if we do not remain faithful to His Word. This has happened in most settings, though most people are oblivious to it, because they have such a distorted view of ‘church.’ They ‘think’ the Ruakh is ’emotion,’ or ‘chill bumps,’ or ‘agape’ fake love, or crying, or running, screaming, or falling down, or spewing incoherently, or ‘dancing in the spirit’; all of these can be foisted on any unwary people group, through music, lighting, and hypnotic techniques that many have used in certain religious settings in America since the 1840s. The Ruakh is TRUTH! The TORAH IS TRUTH. So, ‘someone’ lights the lamp here, after Aharon ASCENDS up before the ‘face’ of it. The word that leaped out at me was MUL. It is actually the word for CIRCUMCISION! The Menorah is in the ‘heart’ of the Temple! Right in front of the veil. ‘Circumcise your HEART!’ This is a TORAH command, Shaul [Paul] did NOT invent it in Romans! What makes one certain he has a Menorah in his heart, in the congregation? Circumcision of the heart? In ancient Judaism [Messianic Judaism!] circumcision of the heart is called ‘Teshuvah!” Turning from sin back to the Torah of Elohim, to HIM. And a lack of this is what Yeshua said would cause HIM to remove the Menorah from the congregation in Ephesus! They were believers! And HE was going to TAKE their Menorah from them. If we read Acts, we see that Ephesus studied the TORAH daily for two years under Shaul’s tutelage. At this point they had TURNED from it, and Yeshua told them TURN BACK TO IT, and DO it! This is circumcision of the heart. Shaul says it applies to JEWS and GENTILES. The Menorah is the Ruakh, with seven ‘breaths’ that light a flame upon Messiah. Read Isaiah 11:1-2 and ‘see’ those seven breaths/flames. 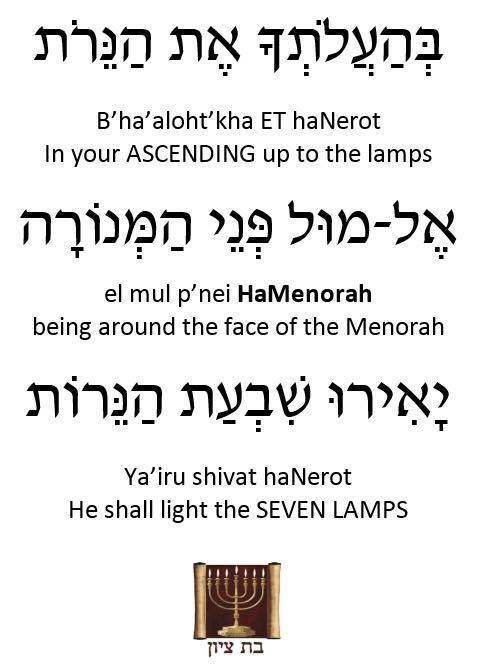 The Menorah is the best symbol of Messiah Yeshua, the Messiah of Israel, the King of the Jews…. Absolute truth! Thanks for breakfast! There is SO MUCH MORE to this! Wish I had time! Light has shined in the darkness, and the darkness cannot comprehend it!